HockeyPucks hiking and highpointing: Whitewall Mtn. - 3405 Ft.
View of Carrigan notch from the Whitewall Mtn. ledges. From Route 302 in Crawford Notch turn in to Zealand Campground. Follow Zealand Rd. to the parking lot at the roads end. DESCRIPTION: from the Zealand Rd. parking area the Zealand Trail begins at the trailhead kiosk. The Zealand Trail meanders through the woods and eventually connects with an old and abandoned railroad grade. The walk is nearly flat as it ascends only 450 Ft. over it's 2.3 miles. 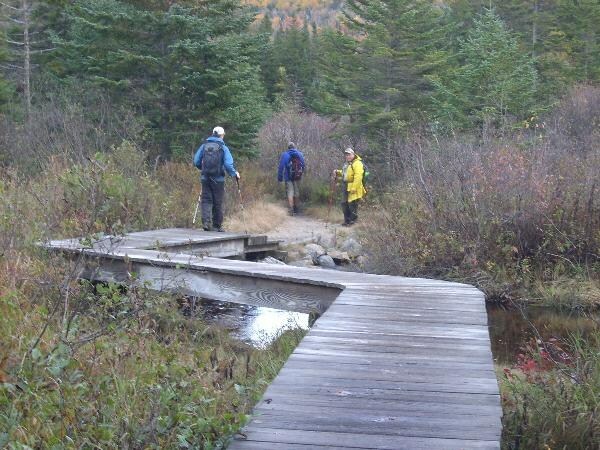 At 2 miles the Zealand trail crosses a wetlands over wooden bridges which provide your first view of Carrigan Notch and the surrounding hills. The junction with the A-Z trail is marked at 2.3 miles. 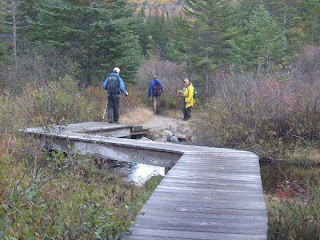 The A-Z trail connects Zealand notch with Crawford Notch and route 302 ascending into the col between Mt. Tom and Mt. Field. This side of A-Z trail is not the primary route to any 4000 footers making it one of the less popular trails and slightly overgrown. The minimal incline of the Zealand Trail becomes slightly more moderate as you transition to the A-Z trail ascending 500 Ft. in 1.1 miles. At 1.1 miles the Crawford Notch Quad Topo map shows a logging road which crosses the A-Z trail at coordinates N44 12.048 W071 28.171. This 'logging road' is not marked or signed and was the start of our bushwhack to Whitewall. Follow the muddy logging road to an altitude of approximately 3200 Ft. at N44 11.660 W071 28.025 and begin your 0.85 mile bushwhack southeast. The fir trees are dense at first then transition into a beautiful birch glade containing chest high ferns. 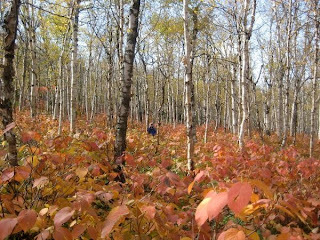 The birch glade is filled with evidence of moose, bear and other wildlife. 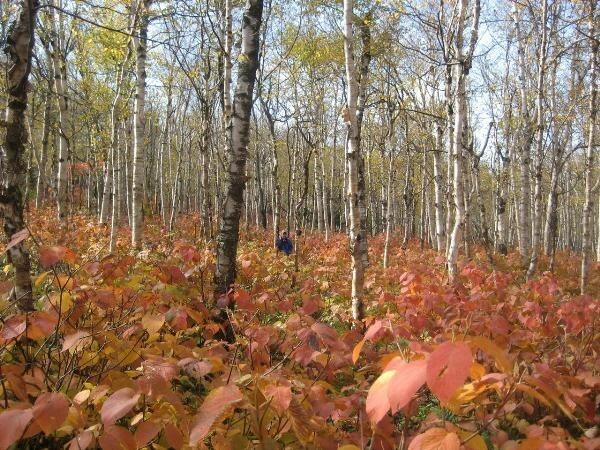 You transition back into fir trees then knee to waist high shrubbery as you get closer and closer to the summit. There are several open bumps each could be the high point as I explored each bump I found a glass jar on a tree to the east. The summit offered limited views. I would recommend continuing the bushwhack 0.25 miles southeast to the open ledges of Whitewall Cliffs. 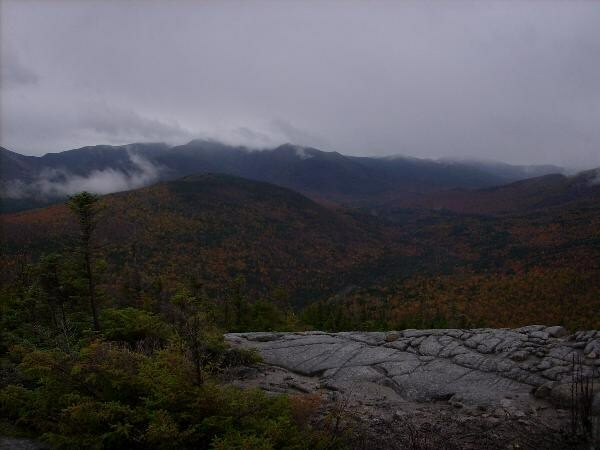 The cliffs provide spectacular views of the Pemigewasset Wilderness, Mt Zealand and Mt. Bond as well as the prominent Carrigan Notch to the South. 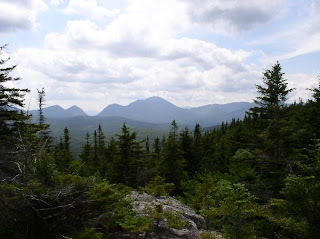 As my descent route I chose to bushwhack 1.3 miles northwest along the Whitewall Ridge skirting the summit directly to the A-Z trail approximately .25 miles from the Zealand Trail junction. The route was thick with overgrown hardwood scrub trees, difficult to navigate and very wet. I will not be providing coordinates or additional details on this route because I would not recommend descending in this direction. At 3405 Ft. Whitewall Mtn. isn't high enough to be on too many lists making it a very isolated and non-popular destination. 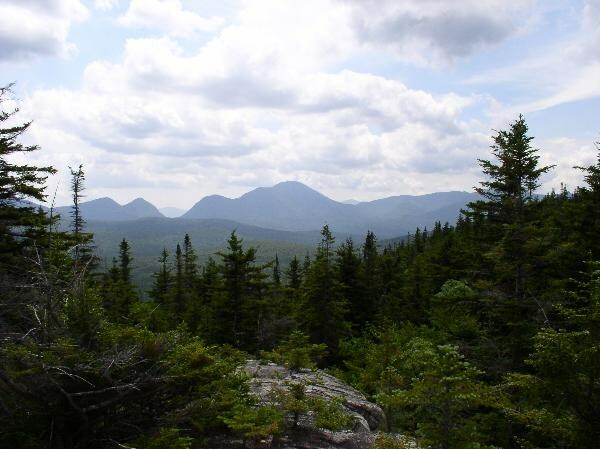 The Pro's are you become one with nature, isolation and are offered amazing views of Carrigan Notch and deep into the Pemigewasset Wilderness. The Con's are it's a trail-less peak requiring a steep talus slope climb or a long bushwhack. I chose the safer but longer bushwhack approach. The Whitewall summit is not prominent nor distinct and required a bit of searching for the highest hump and bump. There are no official markings however a glass jar hanging from a dead fir tree provided a summit register. If you are making the effort to climb Whitewall Mtn. then it's worth the additional extra effort to visit the prominent Whitewall cliffs. The open ledges offer spectacular views in almost every direction. View of Mt. Bond from the Whitewall Mtn. ledges.